Shopventory offers the ability to generate a SKU number for your inventory. 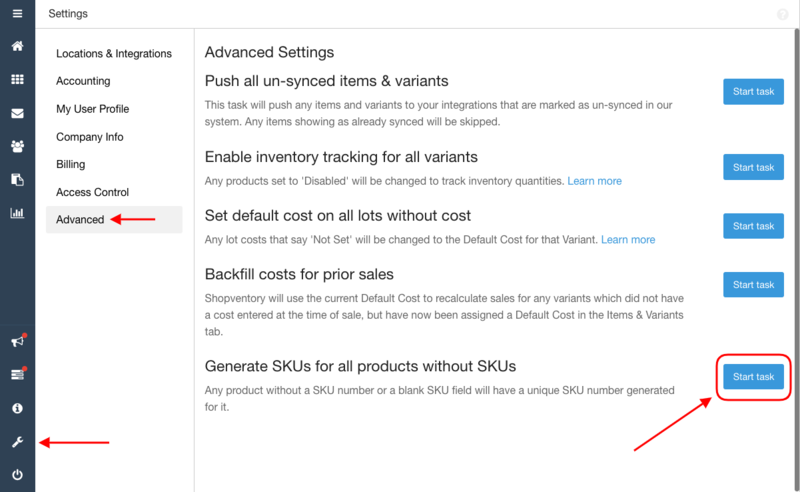 Simply click on the 'Generate SKU' option in the Product panel when creating or editing a product. If you'd like to use the Barcode field instead, simply cut and paste the number from the SKU field into Barcode section. You can also generate SKUs for all products that don't have a SKU number at once from the Advanced page. Just use the Generate SKUs for all products without SKUs task. SKU numbers generated by Shopventory are 12-digit UPC codes (the most backward-compatible industry standard). The first 6 digits of the SKU are linked to the Category field. This means that all Variants will have the same first 6 digits if they're all in the same Category. The following digits are randomized. SKU numbers generated by Shopventory can be used for Tag / Label Printing as the protocol meets the requirements for generating a visual Barcode. SKU numbers generated in Shopventory will be pushed out to the register and should be searchable/scannable at the point of sale. Please let us know if you have any further questions. We are here to help!